I use this Really Useful Box in my car to hold all the bits and pieces I need and to stop them all just rolling around the back of the car, and with a lid that clips shut, if the box was ever to fall over, all the contents would stay put. So this Really Useful Box IS a really useful box! I have about 40 of these boxes in different sizes and use them for a variety of purposes from storing paperwork to car spares. 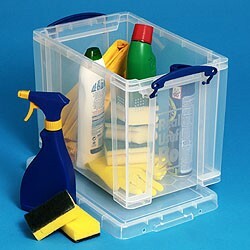 They are ideal for loft, shed or garage storage as they keep their contents clean, dust free and dry. The lids can crack if poorly handled or dropped but I have never experienced a box to fail. 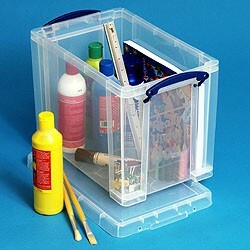 I have bought a variety of "Really Useful" boxes and always been very pleased. This product is no different - I am very pleased with it. I wanted a couple of boxes to in which to gather my documents, statements etc during the year, for my tax returns. This box is ideal, and the lid clips firmly closed to keep out dust (it is not air-tight). When I ordered there was no suggestion that it would include any suspension files, so I ordered some of those separately. As I was ordering an A4 box, I ordered A4 files. Notice: I have seen on Amazon a 24L box that is sized to take Foolscap hangers - and it comes with 10 hangers included. There are also "Really Useful" brand suspension files available on Amazon - but I notice that they all seem to be Foolscap. NOTE TO POTENTIAL NEW BUYERS: Be sure that you know what you are actually buying - it is clear from some questions and reviews that some people are not clear. This box is designed to hold "A4" sized suspension files. There are other boxes that will hold "Foolscap" size suspension files (slightly narrower but longer than A4). A4 documents will usually fit into either size of suspension file. An A4 document is : 210 mm x 297 mm (8.3 in x 11.7 in); A Foolscap document is : 203 mm x 330 mm ( 8.0 in x 13.0 in) The box for A4 files is 19L and the box for Foolscap files is 24L and the box is around 2inches longer then the A4 box. These boxes a good value for money and provide a good stackable solution to storage in limited spaces... will certainly buy again.